Euro NCAP launches NCAP Advanced | What Car? Crash-testing body Euro NCAP has launched a new reward system for emerging safety technologies. 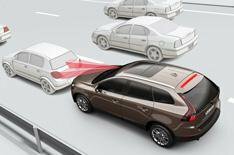 The new system, called Euro NCAP Advanced, is designed to promote new safety technology such as lane-departure-warning systems, blind-spot monitoring and automatic braking. The new rewards will come into effect from this October. NCAP hopes that by highlighting these systems on its website, alongside its familiar crash-test results, consumers will be able to recognise manufacturers that are doing more to promote safety. It also hopes that the scheme will provide an incentive for other car makers to adopt the wider fitment of the latest technologies that might currently be restricted to high-value vehicles.